You'll be £25.00 closer to your next £10.00 credit when you purchase Bicycles, Bloomers and Great War Rationing Recipes. What's this? Order within the next 3 hours, 58 minutes to get your order processed the next working day! 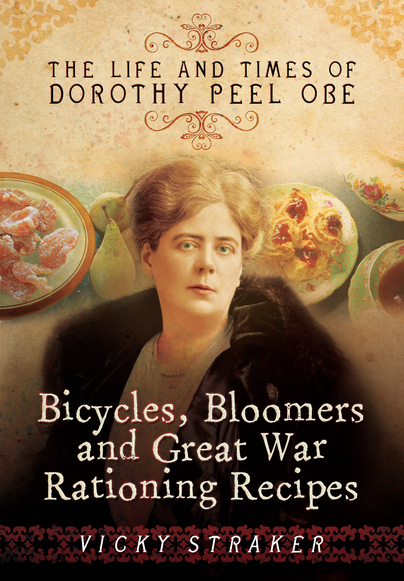 Dorothy Peel was the Nigella Lawson or Delia Smith of her day during the late Victorian to post-war period. In this book, Vicky Straker explores the social history and cultural background behind Dorothy's creations, and the effect of rationing during the First World War. Dorothy played a key role in creating wartime recipes for householders and was awarded an OBE in 1918 for services to the Ministry of Food. Using extracts from her autobiography, and many other books, we are given a unique insight into the life of Dorothy Peel and a new perspective on the period. Her witty, poignant and informative comments reveal a woman with a genuine social conscience, who was in many ways ahead of her time. Written in a light and accessible style, the 12 chapters cover aspects of the era revealing how society changed during the First World War, and when rationing put a strain on every kitchen in the country. Many of Dorothy's recipes are featured in their original form, such as the long forgotten Devilled Bananas, and wartime Potato Gateau. Other mouth-watering recipes include Chicken en Casserole, Cheese Pufflets, and some delicious tea-time treats such as Feather Tart and Candied Pears. Vicky Straker has tried and tested recipes from Dorothy's cookery books, and where appropriate amended them to suit modern tastes. Vicky Straker introduces us to the Mary Berry of the Great War years - for me, by far the most fascinating part of the book is the recipes, but this is also a hugely entertaining and thoroughly absorbing study of a woman who could have been forgotten were it not for the excellent researches of Vicky. Superb biography, and some really interesting recipes to try! 'There is so much that I really like about the book that it is very hard to pick out just a few items, but I particularly liked mention of The Daily Mail newspaper’s revised fashion headline as the war continued of “What Women Can Do” to help the war effort. Also Vicky’s explanations of Dorothy’s philosophy on life and her down-to-earth, no-nonsense, sympathetic attitude to everything from the way people wore their hair to the trial and death of Oscar Wilde. Had she been alive today, Dorothy would make a wonderful Member of Parliament and a brilliant Prime Minister. Read the full book review here! Vicky Straker has a varied background, reading law at university, working for the European Children’s Trust, and teaching refugees to speak English. In 2004 she took a diploma at Leiths School of Food and Wine. Vicky then made handmade chocolates and gave cookery demonstrations before discovering that her great-great grandmother was Dorothy Peel OBE, which inspired her to start working on this book. Vicky lives in Dorset with her husband and two children.